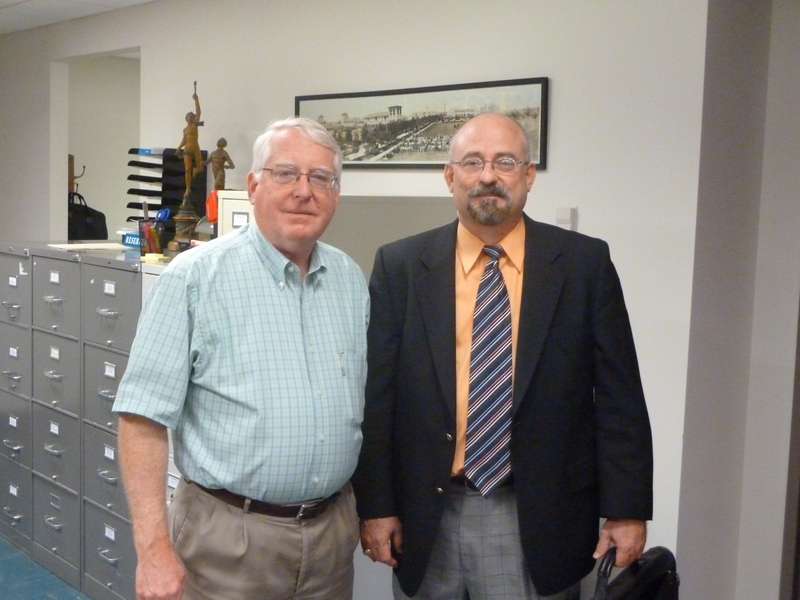 Here's Mr. Rusciano in the Woodson with our own Dr. John Boles. We had a really fun visitor in the Woodson this morning. A nice man named Charles Rusciano came in to give us a 1911 letter that is in large part about Edgar Odell Lovett and the work he was doing to create a new university in Houston, Texas. 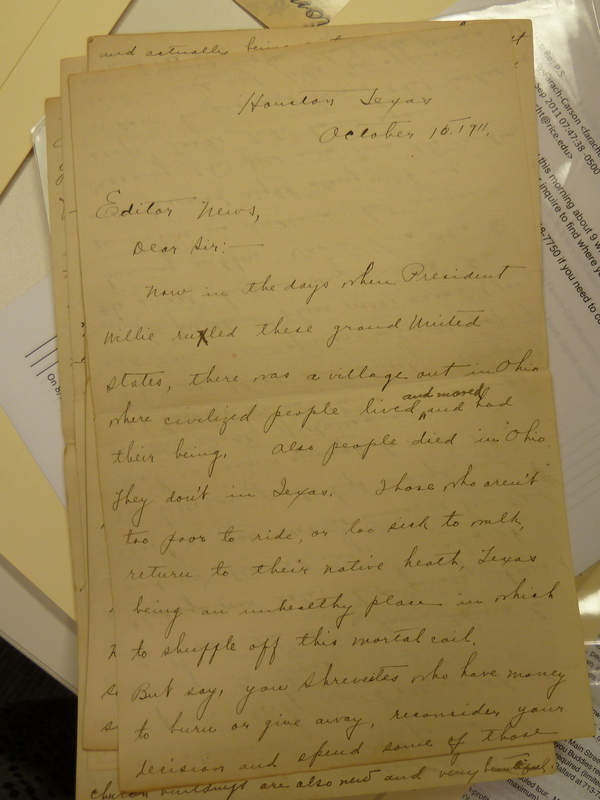 It’s a crazy story, really–he was doing research in the library at Kent State in Ohio and came across this very old, quite thick letter (it’s twenty handwritten pages long) stuck inside a book. Luckily, he saved it–I didn’t totally catch why, but his wife is Rice alumna Carol Huddleston Rusciano, ’83, so he probably recognized the importance of the letter because of her connection. Fun Fact: I posted this from the chair at my hairdresser’s salon! I would have written more, but they’re calling me for my shampoo. Am I to understand that Mr. Rusciano took the original letter from the Kent State library? I certainly hope he had their permission! It wasn’t part of their collection–it was just jammed in there like an old Walgreens receipt or something. It happens all the time. In fact, when people offer to give me their Campaniles I usually decline, but then ask them to look and see what’s been left inside the pages. I’ve gotten some pretty interesting things that way. What Ohio village, do you think? the village she refers to is actually Shreve, Ohio, a small town in Wooster County. I think that is nearly the exact quote I heard from my great-grandmother, Nicky Perry (Mrs. A. C. Perry), about her time in Houston while Rice was being built! But she told me this in 1975 or so. General Phil Sheridan, who grew up in Ohio and who did two tours of duty in Texas, is supposed to have said ” If I owned Texas and Hell, I’d rent out Texas and live in Hell”. I note a quote from scriptures. I like the comment about people dying in OH, but not in Texas, or at least not if they had the money to get out. I look forward to seeing a transcript of the whole letter is possible. sounds very interesting.